Do you fantasize about food when you're at work? 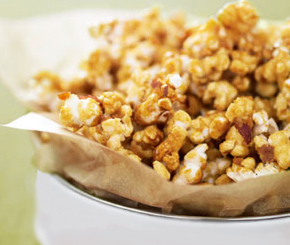 Do you like caramel popcorn? If you answered yes to any of these questions, and assuming that you did say yes to all of them, I shall give you a quick and yum recipe to make honey glazed popcorn at work or home or any other place where you spend a lot of time and fantasize about food! I know watching movies is a random point and kinda not related to work but it is related to the recipe so please forget about it and continue to read the recipe. Pop the bag in the microwave, let the popping happen. Once the pops stop, open bag, mix in a tablespoon or two of honey. Enjoy! It tastes quite a bit like caramel popcorn. If you wanna add some more flavor and calories, try dunking in some peanut butter too! And for the record, I used a spoon.